Here again with this month’s blog is StudioMagic’s President/Co-founder, Harry Kerker. 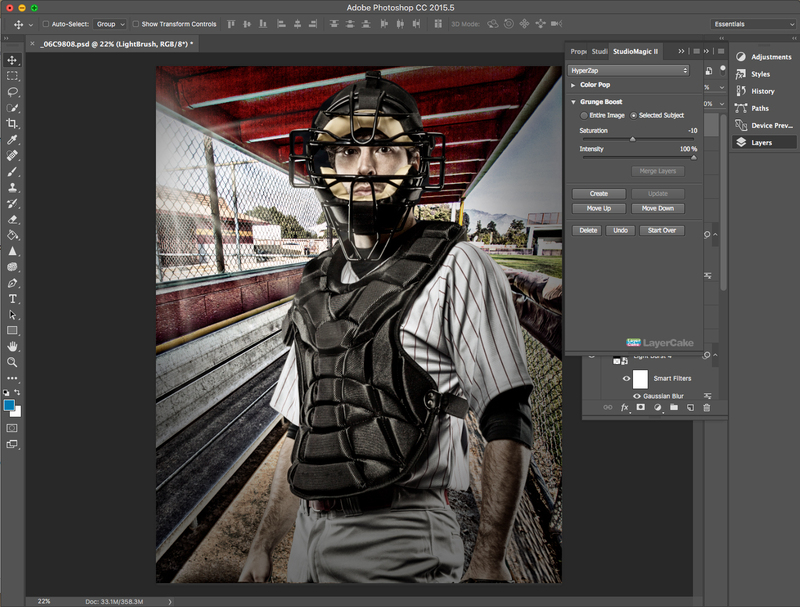 Team Sports photography has become a big business and perhaps the most competitive with the advent of the auto DSLR, which almost anyone can get a good exposure with. So what kind of edge can you get over these auto shooters that will make your images stand out? The newest look in sports is the edgy grunge style. You see it on sports magazine covers, on the web and in movie posters. Most times it goes a step further, when the subject is placed in a cool location like a locker room or an old sports stadium. We’re going to discuss the process of creating these cool new images along with some help from our favorite Photoshop extension, StudioMagic. I’m starting out with my finished image. Pretty gritty huh? I created this image in about five minutes; most of the time was spent experimenting with the level of Grunge Boost I wanted to apply. Step #1. Although it’s a good idea to shoot your players on a solid background to make the selection easier, if there’s good separation between the subject and the background it doesn’t matter that much. Step #2. Remember, there always needs to be a clear distinction between the edges of the player and the colors in the background. 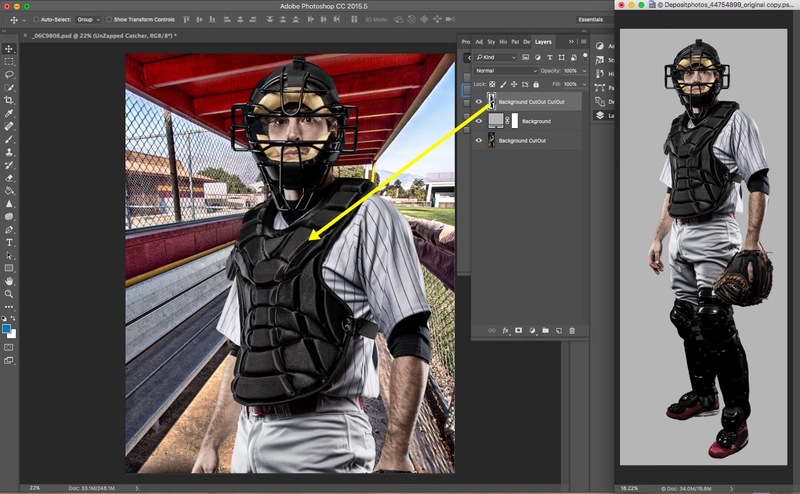 Obviously if the catcher’s chest protector is black and the background were black, there would be no edge to select. In this case the background is green so I have a clear edge to select. I have my StudioMagic 1 panel open and in this case, I’m using the quick select brush, if the background were solid, the magic wand tool, would make a faster selection. Step #3. Once you feel you have a good selection, just hit the “Q” key on your keyboard, which will take you back and forth between the mask and the selection. Work on adding to or subtracting from your selection until it’s as clean as you can get it, then hit “Q” to get back to the selection mode or as some people call it the dancing ants around the subject. Step #4. 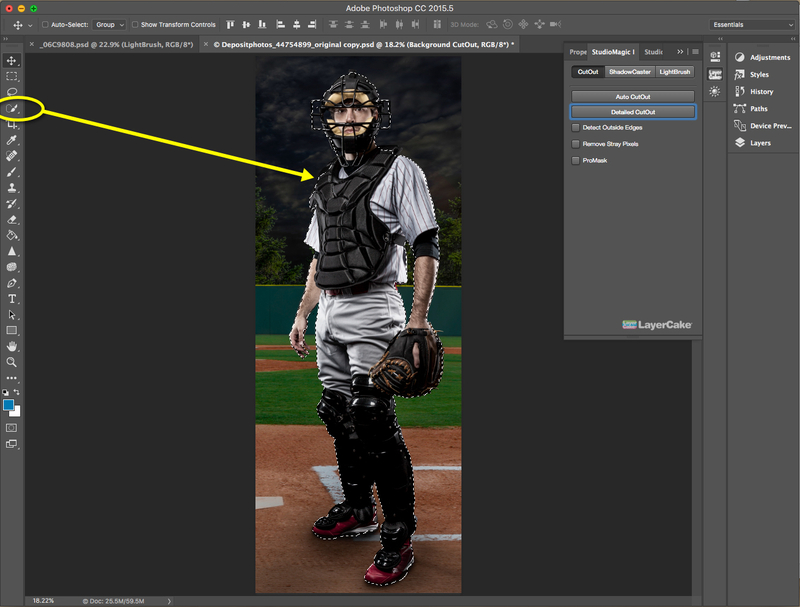 Select “Detailed CutOut” in StudioMagic 1 and the red mask will appear again, do a swipe with a medium size brush around areas with small details that you weren’t able to select, like around his mask and the leather ties on his glove, them hit the Detailed “CutOut” button and your subject will be automatically cut out and placed against a gray background. Your original image will be behind it, in case you need it at a later date. Step #5. 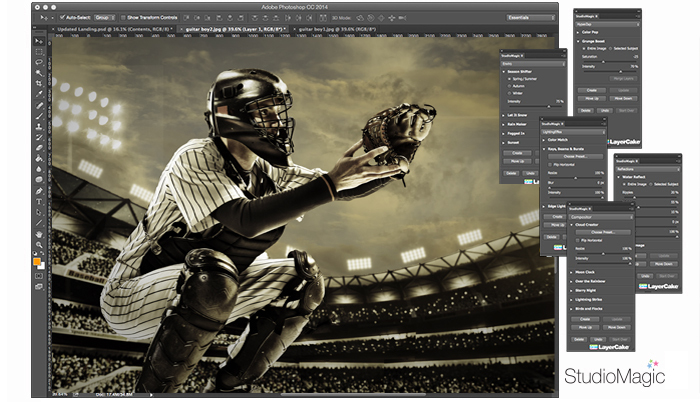 Choose a background from yours or LayerCake’s library of sports locations. Be sure you choose a background where the angle and point-of-view matches your subject’s as closely as possible. This ordinary high school dugout is photographed about chest high. Step #6. 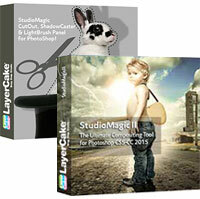 Open StudioMagic 2 and the HyperZap module. Select “Grunge Boost” select the “Entire Image” radio button and hit the “Create” Button. 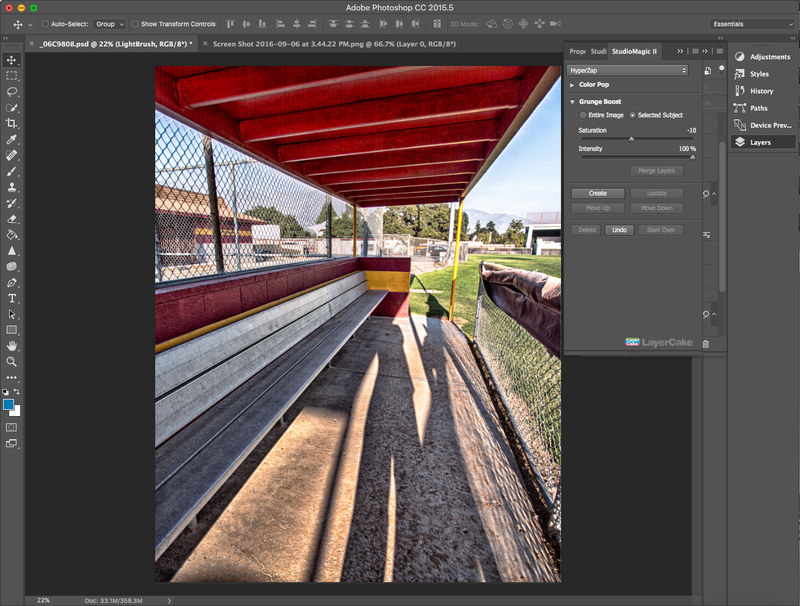 Apply more or less Intensity and saturation with the sliders and hit the update button to apply your latest changes until you get the look you are looking for. Step #7. Open your cutout catcher in another window. 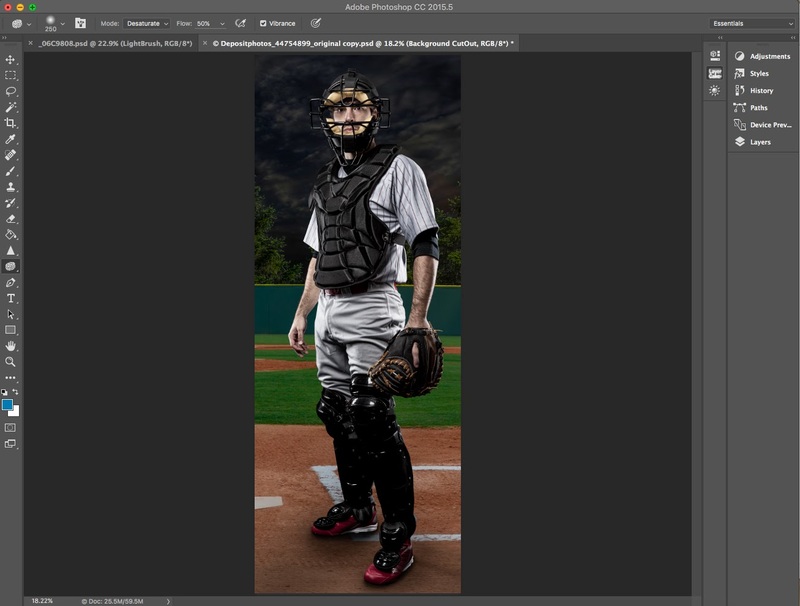 If it’s stacked in tabs, pull the catcher tab out of the grouping so it creates it’s own window, then place it next to your background image. With your layers pallet open, drag the cutout catcher layer over into the background image. Resize your player the size you want it by hitting “Command T” on a Mac or “Option T” on a PC. A box will appear around the catcher, with the shift key held, grab and anchor point and slowly drag to resize. Holding the shift key keeps the image proportionate as you drag. Sometimes the box and anchors will be off the page, to see the entire box and four ancors, hit “Command O” on a Mac or “Option O” on a PC. Step #8. 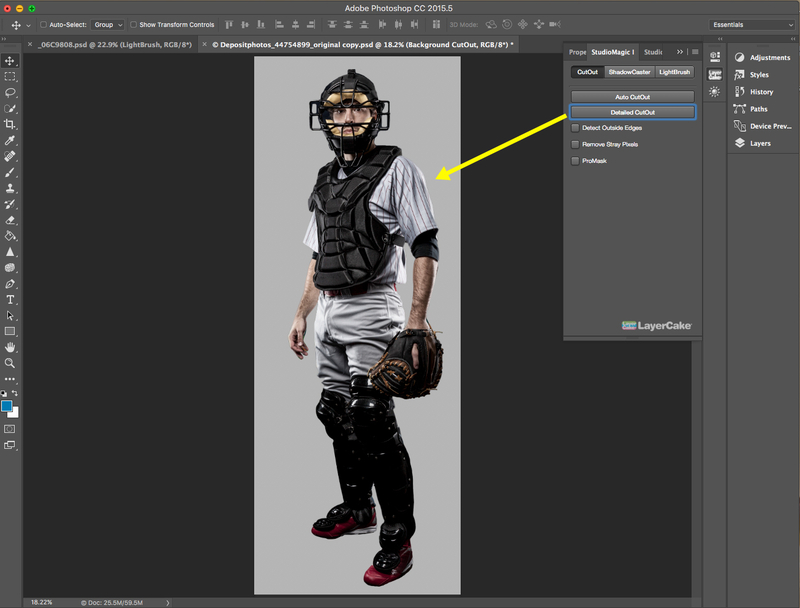 Select your catcher layer and go back to Grunge Boost. This time activate the “Selected Subject” radio button. Match the player to the look of the background by sliding the sliders and hitting update until you like it. Now you could have applied Grunge Boost to the entire image in one application, but I like to apply them separately so I can get the perfect balance. Lastly use the LightBrush tool in StudioMagic 1 to make the player stand out, and maybe add a little LightBurst from StudioMagic 2 for some extra drama! « The Power of Light!